Height charts for children are not always an easy thing to incorporate into home decor. 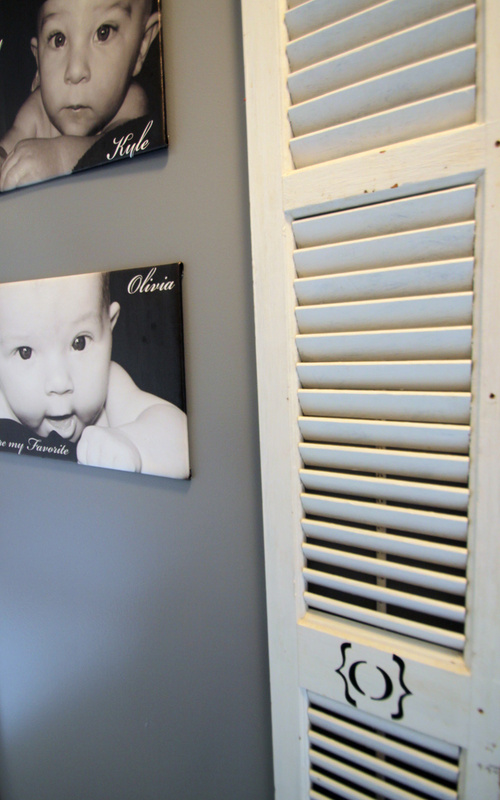 I used these old, charming, rustic shutters paired with some canvas baby photos of my little ones to create a perfect area to display how much they have grown. When at my in-laws one day, I noticed a thin piece of Sheetrock laying up against their wall. As I investigated further my heart fluttered as I realized what it was. It was a height chart for their three children (one of which I am lucky enough to call my husband). Their children are all grown up and moved out of the house. All I could imagine was them drawing those little lines for each child year after year. I instantly knew that I wanted something like that in our home. Something that we could have in our home for years, something that would not go out of style, or look out of place. I have seen many people use old shutters in their homes to decorate and thought they would be the perfect solution. When shopping at an antique store near our house I asked if they had any old chippy shutters that where long and narrow. The owner of the store went to the back, and came walking out with exactly what I had in mind! I gasped as I asked how much she wanted for the, hoping it wouldn’t be outrageous – because I really really wanted to take them home. $20.00 – I contained myself and saved my happy dance for at home as I excitedly brought them in the house. They were the perfect size for our long and bland hallway, just thin enough to hang on the wall without protruding too much. 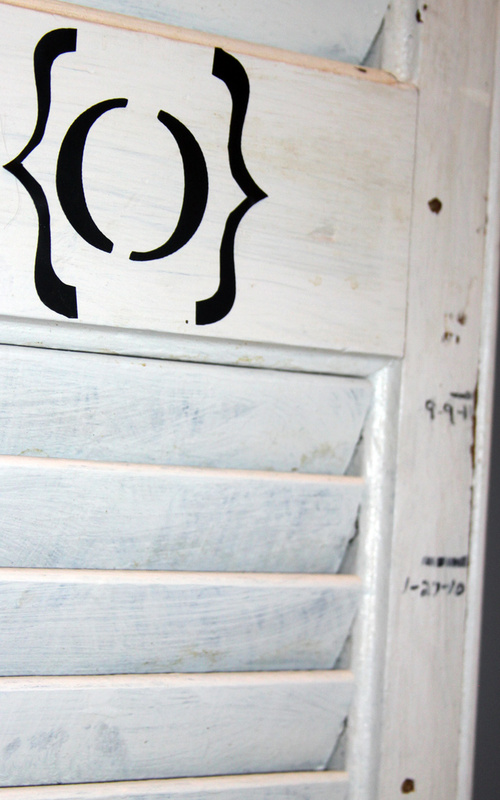 I added the kid’s monograms, one onto each of the shutters in parenthesis and simply hung them on the wall. I made the initials out of black vinyl on a Cricut machine. Each time I measure them I write it on with permanent marker and then sand over it a tiny bit. 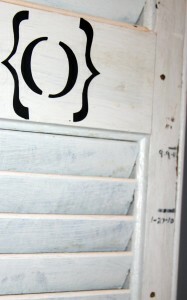 Since the paint on the shutters is old and chippy I think it looks better to have it distressed a little and not in bold black marker. 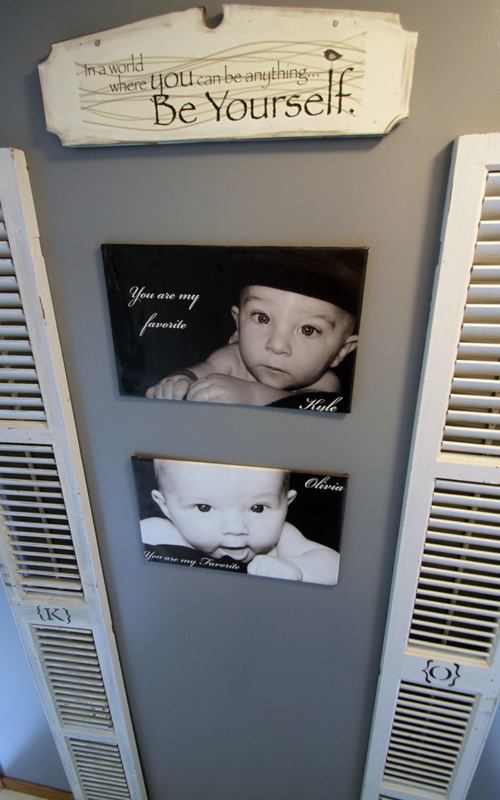 I ordered my favorite pictures that I took of each of my kids as babies on canvas. 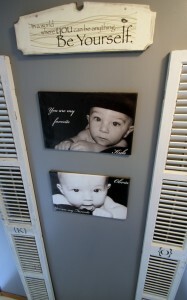 They were not stretched over a frame so they were very inexpensive. I think they were $18 for both including shipping. We wanted them to have the canvas look, but not the stick out too far. We cut pieces of plywood to size and wrapped the canvases on ourselves. I added their names to their photos when I ordered them. I also added a phrase to the canvas that I say to them every night before bed. 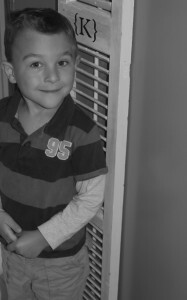 “You are my favorite” (my favorite things, not my favorite child). They have always smiled with delight whenever they hear me say it. I added a little plaque over the top of the pictures that says “In a world where you can be anything, be yourself”. What a perfect phrase for this spot in our home. I found the little decal at the Dollar Tree, if you would believe it. I Painted an old sign that we already had (that didn’t match the decor anymore) to put the decal on. It was painted white and glazed with a little black so that it matched the shutters. The kids are always really excited when it is time to measure and see how much they have grown. I love, love, love this wall. 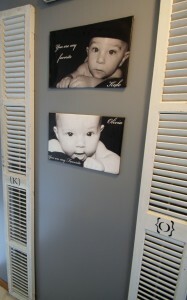 I love the mixture of old antique shutters with the more modern black and white canvas pictures. 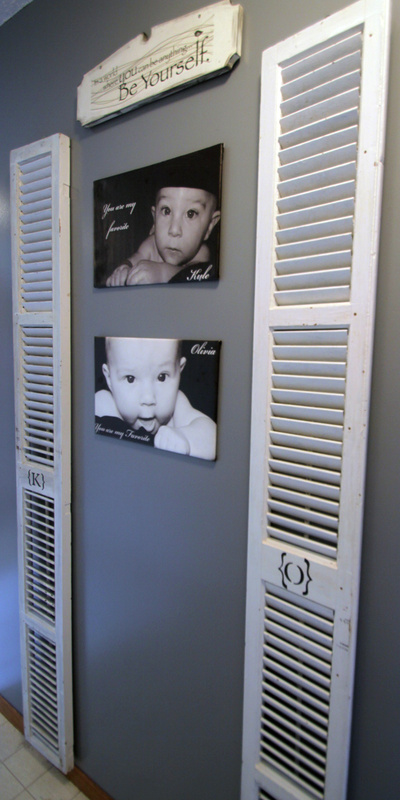 I know we will always have these shutters in our home, and they will always remind me of a happy time in our lives. Even if things change in our house and they get moved around – they will fit anywhere and always mean a lot to my husband and I. Altogether this project cost me $39.00. Not bad for my favorite wall in the house! This is the cutest idea. I love it. The photos are absolutely adorable as well. OMG… i love this idea. Being a Marine wife for 8 years, we have moved many, many times. 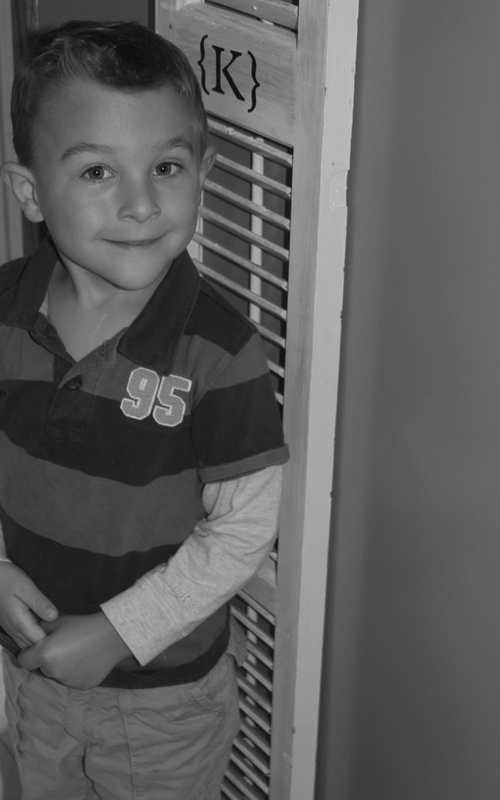 Living in base housing, we can not make these memories of our child’s growth on the walls, so this is a absolutely great way for us to track his growth and be able to take it with us wherever we may live. What a great solution for your family!! I had not thought of this idea for that specific situation! Thanks for stopping and I sure hope your height chart works out great!